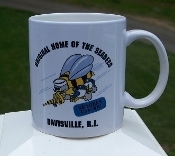 Original Home of the Seabees mug, print both sides. 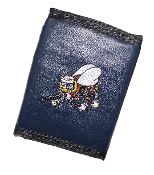 Seabee Novelty Bill, click image for details. Just $1 for a "Million Thanks". 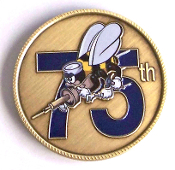 Seabee Museum Challenge Coin, click image for details. Limited supply! Just $8 while they last. "Original Home of the Seabees, Davisville, RI." 100% pre-shrunk qualty cotton t-shirt with full color appliqué. The Museum's exclusive photo-mug features top quality graphics. Click options to learn more. Peruvian pima cotton, three button Devon & Jones Seabee polo style golf shirts with a colorful embroidered FIGHTING BEE. We challenge you to find a finer embroidered Bee. A 100% pre-shrunk qualty cotton t-shirt featuring a full color FIGHTING BEE appliqué. 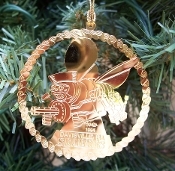 An exclusive 3 1/2-inch diameter embroidered Seabee Museum and Memorial Park patch. This patch was designed for us and is not available elsewhere. CLICK IMAGE FOR DETAILS.